The Rogue posted a U.S. sales gain of 45 percent last month over April 2014. Nissan Motor Corp. rode its freshened lineup of Nissan and Infiniti utilities and crossovers to total U.S. sales of 109,848 vehicles, an April record. 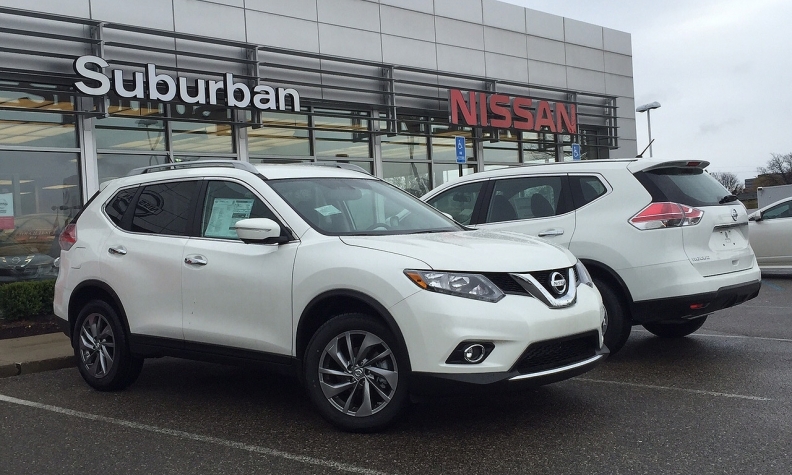 The recently redesigned Rogue and Murano utilities were the Nissan brand’s biggest stars in April, with sales gains of 45 percent and 73 percent over April 2014. Three of four Infiniti utilities posted gains in April over the year-ago period. Seven of Nissan’s nine car nameplates posted volume declines in April over the year-ago period. The small Sentra sedan bucked the trend, with deliveries of 17,059 vehicles, a 21 percent gain. One of Nissan’s two aging sports cars, the 370Z, continued its slow fade in April, traditionally a strong month for sports car sales. Nissan sold just 768 370Zs last month. But U.S. deliveries of the GT-R sports car rose by 39 units from April 2014, or 32 percent, to 162, and they are up 44 percent year to date. Still, GT-R volume remains small compared with similarly priced competitors, such as the Chevrolet Corvette and Porsche 911. With Ford’s revamped Mustang selling well and Chevrolet planning to unveil the redesigned 2016 Camaro in two weeks, Nissan has no plans to boost incentives on the 370Z. Diaz attributes the slight spike in GT-R sales to the performance the car offers for the price. Nissan is on track to launch the newly redesigned Titan pickup on time at the end of the year, Diaz added, with the first of the new trucks scheduled to arrive in late December or early January. Diaz said he expects May to deliver continued moderate growth overall for the industry, with strong demand for utilities. “Light trucks and crossovers will do really well,” he said. The battery-powered Leaf dipped 26 percent over a year ago, with sales of 1,553 vehicles. Consumers have been buying fewer fuel-efficient cars as U.S. gasoline prices remain low. Sales of two Leaf competitors, the Chevrolet Volt and Ford C-Max, also dipped in April. The Infiniti luxury brand posted April sales of 9,979 vehicles, an 8.8 percent gain over a year ago. Three utilities posted higher sales over April 2014, while the Q50 and Q70 sedans improved sales from the year-ago period.